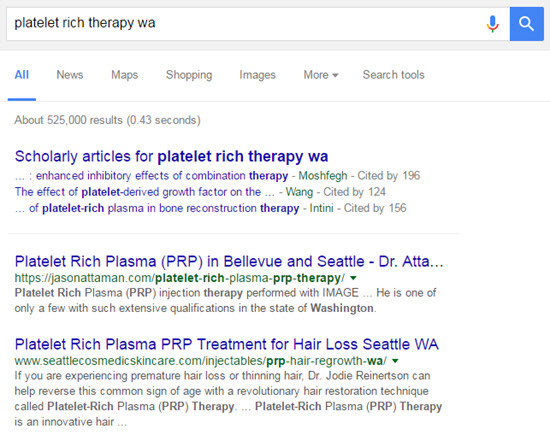 You probably want to reach more customers/clients/patients outside your immediate area. The question is: how? In general, what I recommend is to specialize as much as possible, work your tail off to earn relevant links over time, and maybe create great “city”/location pages or “state” pages. Spend most of your time on those things and you’ll do well. But that’s general advice, and it doesn’t necessarily address what work you might need to put into your site, which is a big part of the equation. A real-life example might come in handy. Joe Dillon of Equitable Mediation Services has provided me with a good case-study of a “local” business owner who expanded his reach, mostly just by nailing the on-site content. 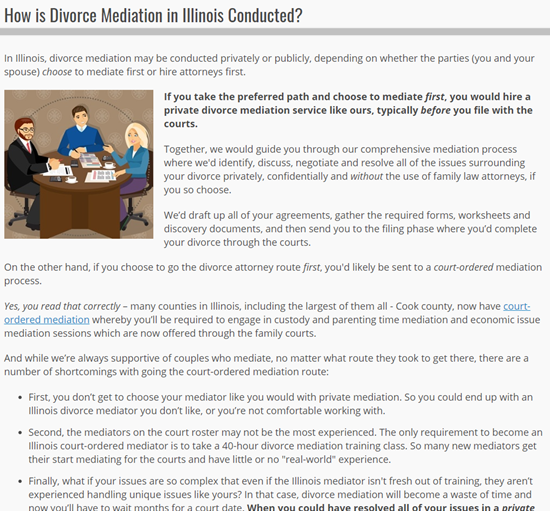 Joe and his wife, Cheryl, are divorce mediators. They work in-person with clients, but fly all over the country to do it. 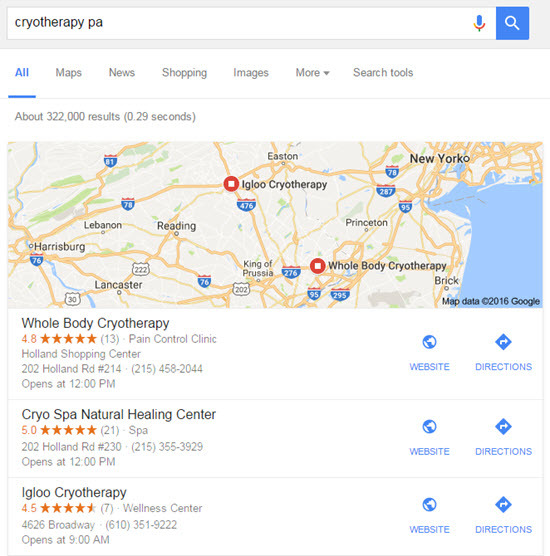 They didn’t need visibility in Google’s non-local organic results, but needed to get visible in specific local markets. 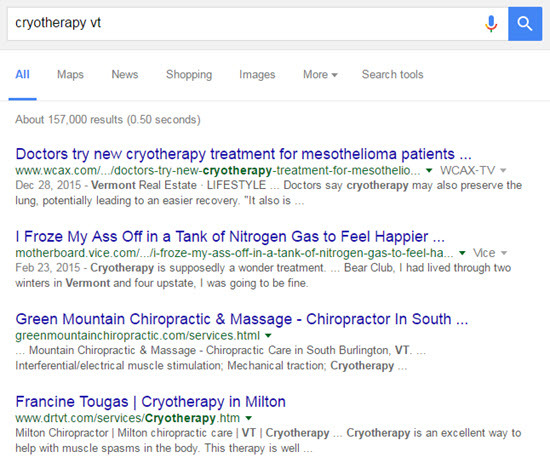 In their case, they wanted to get more visible in specific states, for certain state-specific search terms. We worked together at the beginning of 2017, when Joe and Cheryl had me do an X-Ray – meaning I did a comprehensive audit of their situation and gave them an easy-to-follow report with all my specific suggestions. As of this writing, Joe and Cheryl haven’t taken all of my suggestions. Also, they were doing a number of things very well even before the audit. Still, they’ve taken enough suggestions to see results, put in serious work, and are a great example of how to cast a wider net. Because every situation is different, you probably can’t do the exact steps Joe describes and expect the same results. 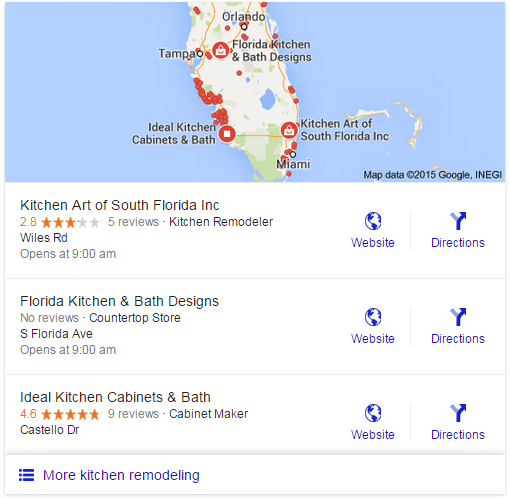 Local SEO is not a paint-by-numbers deal. But at the very least his case-study will give you some ideas, and should make your next steps a little clearer. 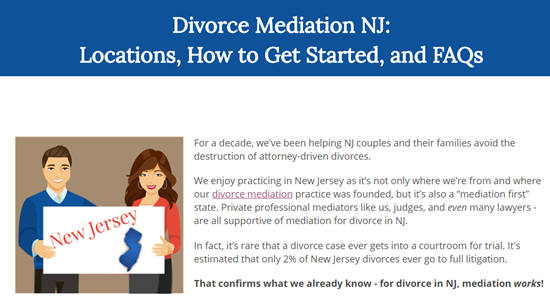 A long time ago, in a galaxy far, far, away (well, New Jersey in 2008), my wife / business partner and I decided to start a divorce mediation firm to help people in NJ and Illinois get a divorce – if they want one – without lawyers. Like any small business that is strapped for cash when it first starts out, we had to be efficient with our marketing dollars. Which meant having to be even smarter with how we spent our time. So we decided we would try to get clients by blogging. It was free, there was a lot to write about, and since the phone wasn’t ringing yet, we had the time. Blogging served us quite well. Before we knew it, traffic to our site had quadrupled over the course of two years, and we were getting clients. Life was good. One day, I decided to take a closer look at Google Analytics to see exactly where in the state these people were coming from. Much to my surprise, I found our traffic was no longer coming from only New Jersey and Illinois, but from all over the US. Divorce is a state-specific issue, because the guidelines that govern how a settlement is reached change significantly from state to state. 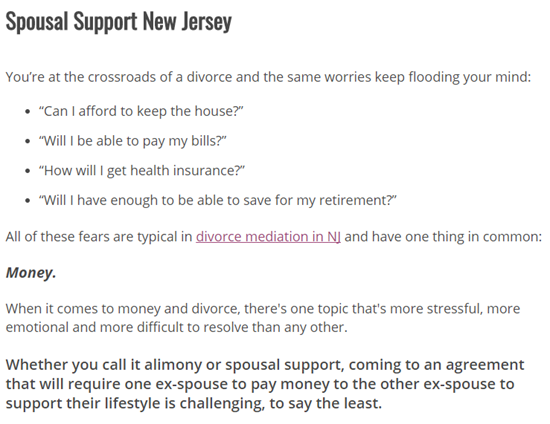 So there is little sense in a visitor from California reading an article about “Alimony in New Jersey.” Yet that described most of our visitors. So my better half and I reviewed the data, and decided to start serving clients in three additional states: California, New York, and Pennsylvania. It wasn’t a decision we made casually, because we had to think out the logistics, and we knew we’d be in for a certain amount of work. 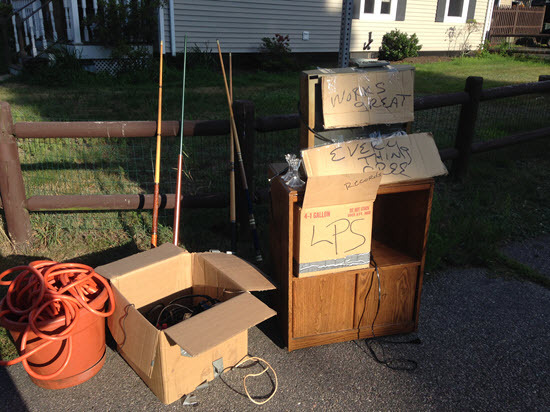 We decided to expand our “service area” for two reasons. 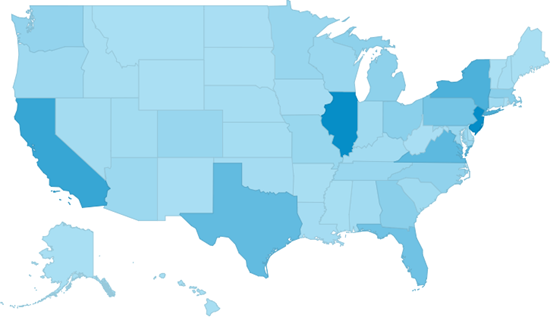 First, we were already getting some visitors from those three states. Second, divorce in those states is handled similarly to how it’s handled in Illinois and New Jersey (where we’d already seen clients). Before we could begin helping people in these states, we knew we needed to change the structure of our website in a pretty significant way, as it was targeted exclusively to New Jersey and Illinois visitors. Before the big revamp, our approach had been to welcome everyone in the front door (the homepage) and then funnel them through the site depending on where they were in the process, or what information they were looking to find. The new plan was to have more visitors land deep into the site, on a state-specific blog post or page, so that they got the sense right away we knew the issues in their state and could help them where they lived. From there, we would encourage them to visit a state-specific hub page (so they could see where we could meet with them), and from there to encourage them to book an initial meeting. In effect, we wanted to reverse the path visitors used took through our website. How could we rank for three new states without hurting our existing rankings in New Jersey and Illinois? How could we convey to visitors that we weren’t some big corporation or franchise, but rather the same husband-and-wife team we’d always been? How could we convince visitors who live far from one of our office locations that we could help them negotiate the terms of their divorce virtually AND get them the same good results as if they met with us face-to-face? How could we show any given visitor that we had expertise specifically in his or her state? As I said, divorce laws and processes differ from state to state. So it’s a good fit for state-level local SEO, and there is plenty of helpful content one could create on how child support or alimony and things like that work in each of the new states we were practicing in. The one thing we did not want to do was write thin content, or simply duplicate content, just to add blog posts for the three new states we wanted to target. First, we didn’t want visitors to see right away that we practice in five states. By putting up blog posts, we were able in effect to “hide” them until visitors were ready to see them. That may seem counterintuitive, but we didn’t want to scare visitors off right away thinking we were some large corporation. 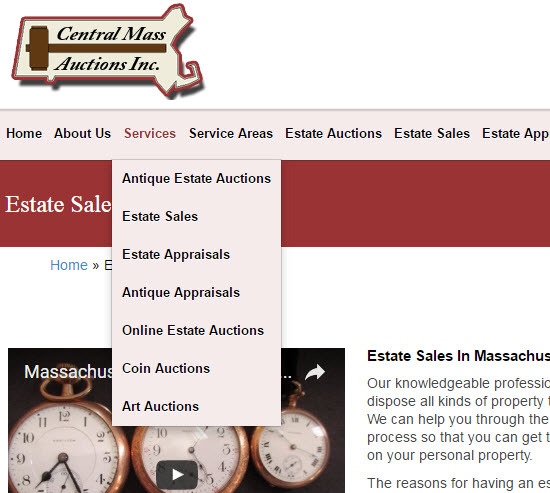 Second, writing blog posts instead of pages allowed us to use state-specific category tags. That way, when a visitor reads our blog and searches posts by category, they can choose the state they live in and be served content relevant to where they live. 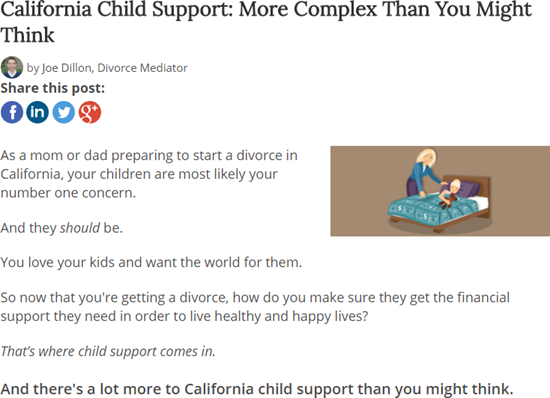 For example, a California visitor can choose the “California” tag and read an article about Child Support in California. Then we built five new “state” hub pages for each of the states we were practicing in – and put SERIOUS work into those pages. 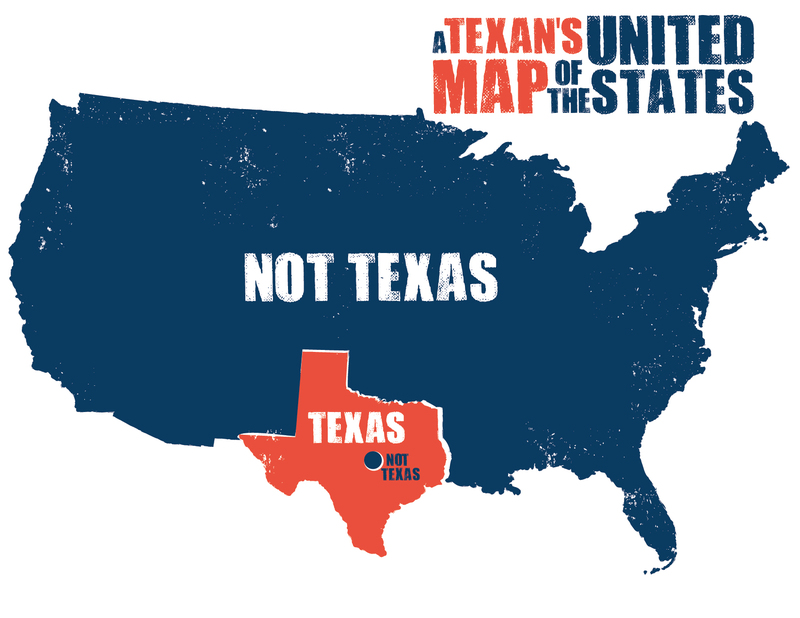 This was the biggest challenge, as we had to come up with even more state-specific content that wouldn’t overlap with the blog posts we created. 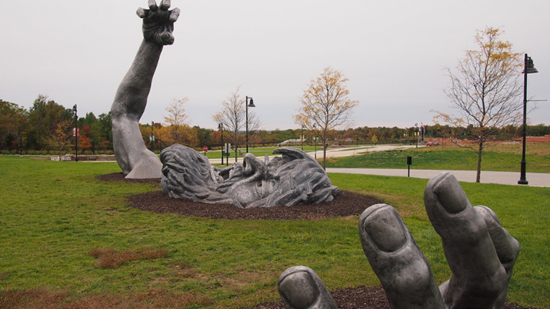 Here too, we wanted to give visitors a sense that we knew their state, and weren’t some faceless corporation. So we wrote unique intros for each state hub page to show our local knowledge and to drop some state-specific references. 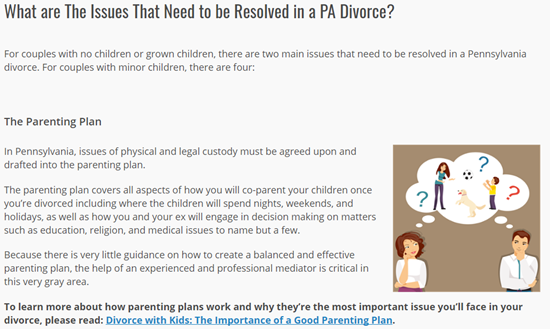 We created a high-level overview of the four main topics of divorce in each of the five states, with links to the state-specific blog posts. We also put ON our “state” pages some frequently asked questions that address head-on who we are and why we practice all over the place. We also fielded inquiries from visitors in each state regarding their most frequently asked questions, and answered them right on the page. 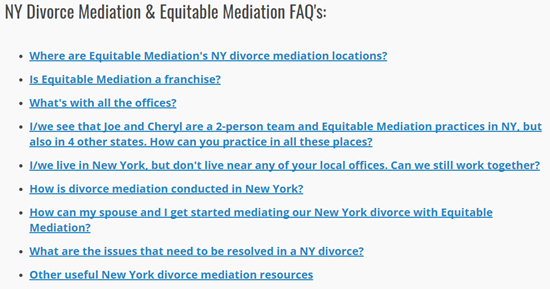 Those FAQs were in addition to the more-general ones we added to each state page. That process gave us a bunch of new content ideas. And since it addressed a question from a specific visitor in a specific state, our logic was that if one person had that question, maybe other visitors in that state did too. Once we had the new, detailed, state-specific content (described above), we could take links from our blog posts and point them to the state hub pages, and vice versa. 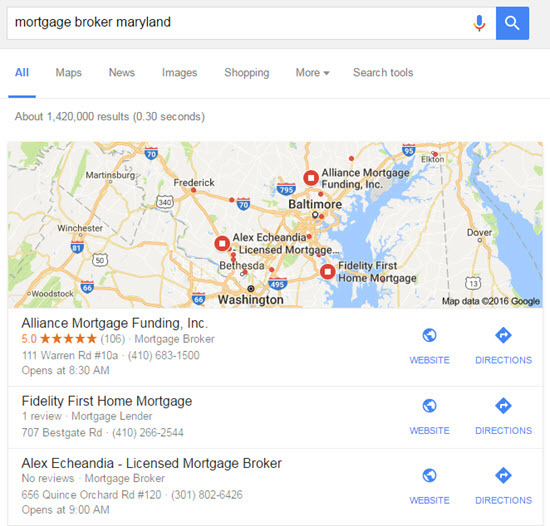 Google seems to like internal linking, and visitors who landed on one resource might find other relevant and valuable, so we figured a two-way trail of breadcrumbs could only help. Also, once we had the “state” pages we linked to each one in our footer. Again, we figured both Google and people would find those helpful. 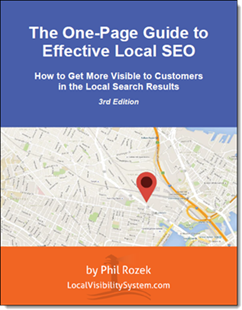 Phil advised us not to try to “optimize” the homepage for 5 different states, but rather to make it describe in more detail our services, with just enough info about each state to make it clear to Google and clients where we work. 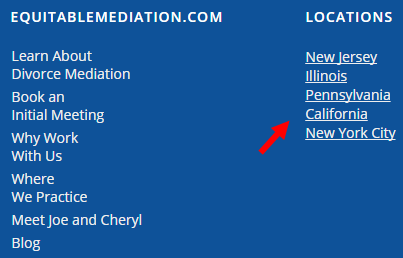 Before, we struggled with how to “optimize” for New Jersey and Illinois on the same page. Stuffing in state modifiers everywhere got awkward. 117 characters, in case you’re curious. Ouch. Not exactly helping with the whole “we’re a small, two-person husband and wife team and not a franchise” vibe. Also, if we were going to get our state hub pages to rank for the state-specific terms we wanted, we were going to have to move those tags, and the related state-specific content, over to those pages. This was the scariest part of the plan, because we weren’t sure how well it would be received by Google, and whether we’d mess up the rankings we already had and not pick up additional rankings. Part of the restructuring between the homepage and state pages was to move the really detailed, state-specific content from the homepage to the state pages. 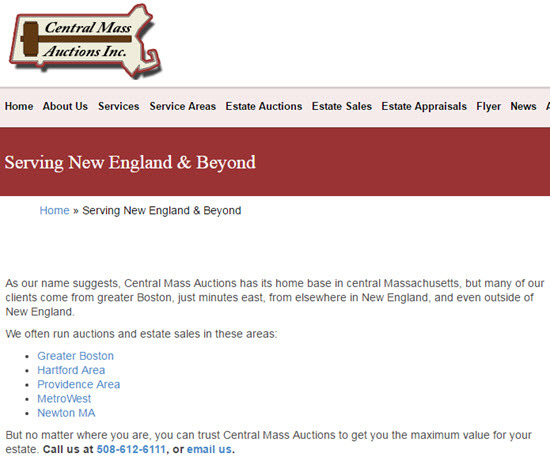 But we still wanted some location-specific info on the homepage, so we added to the homepage a section on each state. Making this kind of jump required a significant leap of faith. Faith that our plan was the right plan, as you never know with the search engines if what you’re doing will help or hurt. Faith that our state hub pages, and state-specific blog posts, would more than make up for any potential lost traffic to our homepage. Faith this wasn’t just a big waste of time. Faith that our visitors would respond to our messages, get to know us as humans and not some faceless corporation, and respond by booking a meeting with us. If things didn’t work out as planned, we would simply revert back to practicing exclusively in Illinois and New Jersey as our business was fine as it was. But given the traffic we had from visitors from other states, and the fact that people throughout the United States get divorced, we felt we had to stick our necks farther out of the shell. While it’s only been a few months since everything has gone live, so far the effort has been worth it. And most importantly, grown our bottom line revenues by 17% with that growth coming exclusively from the three new states we added to our practice – and reached by changing our strategy. We believe that once we have a full year of these pages being live, and our ranking climb into the Top 10 for our key search terms, that contribution to our bottom line will grow. Here is a screenshot of visitors from California from February 1st thru November 30th. My partner and I are not the best multi-taskers. We prefer to work on one thing at a time, and see things through from start to finish, sometimes at the detriment of other tasks or priorities. So finding the time to write blog posts, create new pages on our site, and monitor our results while servicing our current clients was challenging for us to say the least. But despite the significant increase to our workload, and competition among multiple priorities this new project would create, we felt it was important to do it ourselves. Given the proliferation of “content marketing and creation professionals” separating the good from the bad from the ugly has become far too time-consuming for a small business like us. You would think with all the “writers” out there it would be easy to find someone good to help, and that that person would be a net time-saver. Neither of those is an outcome you can count on. And given that this project took more than 5 months to complete (that’s 100’s of hours of man and woman power) we had to take the long view and key our eye on the prize, as results were not quick to come. Especially as we worked on it in-between our day jobs! Key Takeaway #1: Don’t just wing it. If possible, hire a professional to help you build a plan. Or plan yourself. Just plan! As business owners, we’re sometimes too close to our businesses and miss things that others can more easily see. Bringing in someone from the outside can give you a fresh perspective on what you’re doing well, and what areas you could improve on. An experienced professional can also give you peace of mind, and can be a sounding board for ideas. We could have pumped out 50 more blog posts, or gone crazy trying to optimize our homepage for 5 different states, and it may or may not have worked out. We were tempted to try, but we’re glad we were able to reach more states after all by using less ham-handed methods. Even if you choose not to work with a professional, there are many resources you can tap into to put together an action plan of you own to follow. One site I find helpful is the U.S. Small Business Administration and their “Small Business Guide” section in particular. When you think about it, expanding into a new territory or market is kind of like starting a new business. You need to do market research, competitive analysis, write a business plan, calculate your costs to expand into that new market, and put together a plan. It’s probably not your idea of fun, but it’s better than launching into a strategy that you just have to abandon. Key Takeaway #2: Decide what you want, why you want it, and what you’re willing to do to make it happen. I’d love it if I could just snap my fingers and grow by business. Wouldn’t that be great? The reality is it takes a lot of time, dedication, and hard work to grow. And if you’re not willing to commit 100% to the process, forget about taking on a new project in the first place. Do I have the time in my day to commit to a new project? If you are already burning the candle at both ends, you’ll only stress yourself out by piling even more work that you simply won’t have time to do. Make sure you can commit the time needed to give your idea the best chance at success. Do I have the emotional bandwidth to commit to a new project? You ever have one of those days where you just don’t feel like getting out of bed? Yeah, me too. Imagine feeling that way every day. And adding a new project to your mix. You might have the time for a new project but not the drive. And it’s the drive that’s going to get it done. Not just how many hours in the day you have free to work on it. Why am I considering this new project? Is it because I’m bored and I’m looking for something to do? Is it because I don’t want to address a significant concern in my business? Am I chasing some trend with no idea if it will help me or my bottom line? (Hello, social media!) If it doesn’t grow your business or move it forward in some way, don’t do it. Period. Is my plan solid? Do I even have a plan? How many clichés would you like me to throw at you here? How about “if you fail to plan, you plan to fail” or the one about SMART goals. You may think of these as clichés but the fact is they’re universal truths. I’m guessing you don’t have unlimited time and money to waste so you better have a plan and be measuring your progress and results against it. Do I have the resources in-house to accomplish this? Or do I have to outsource some or all of it? As I previously mentioned, finding a competent professional to help you can be a real challenge. If you can’t find someone to help you execute the plan, can you and your team do it yourself? Or will the unfinished work become an albatross around your neck? What if my project doesn’t succeed? You shudder at the thought, but you’ve got to think about it. As small business owners we want to believe that our ideas are always right on the money because we know our customers and our crafts. But you must consider the possibility that your idea may not work out. And you’ll be left standing in the very same spot you are right now. You OK with that? You can afford to have it work out and reach and serve more customers, maybe even ones from another city or state. But can you afford for it not to work out? Can you take the hit? Many business owner friends of mine have dozens of irons in the fire but never manage to complete a single project. They’ve got no time, no plan, and no resources assigned to it. They might try easy “fixes,” but nothing more. That leaves them mentally drained, stressed out by all the undone work, and frustrated that their business isn’t growing. “I’m doing all I can!” they say. As they post pictures of themselves at the beach. On a Tuesday. At 2:30 in the afternoon. Actions speak louder than words. If you want to grow, you need to make sure your actions are aligned with your desires. You can’t just speak the words and revenue will flow. You need to do work no one else is willing to do. Take the chances that no one else is willing to take. And pursue your goals with laser-like focus. I’ve found this is the only way to get things done as there are lots of other distractions out there competing for my attention. If I don’t put my head down, and execute my plan, I can easily find myself playing fetch with my dog, playing the guitar, or doing one of a hundred other things that don’t contribute to my bottom line. And if you don’t want to grow, that’s OK too. I know plenty of business owners who are content exactly where they are. They work as hard as they want, and balance their business growth with other, perhaps higher priorities. For instance, I have a friend who runs a small mortgage business, but his focus is on “being there” for his two high-school aged sons. Sure, he could grow, because there are lots of people who buy houses and need mortgages, but he’d rather spend the time it would take to grow doing other things. That’s perfectly fine. 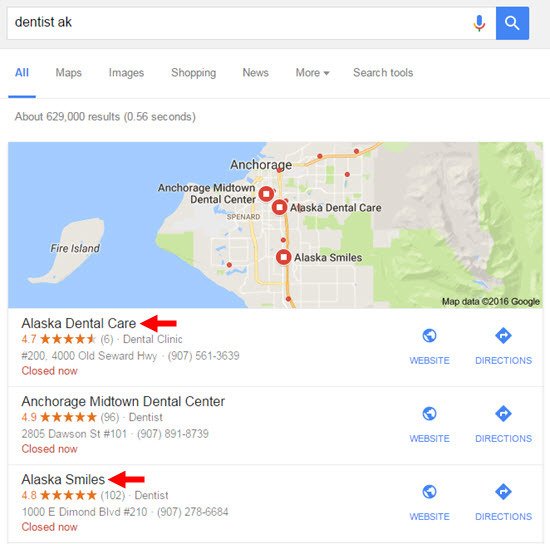 Key Takeaway #3: There’s more to local SEO than your Google My Business pages! 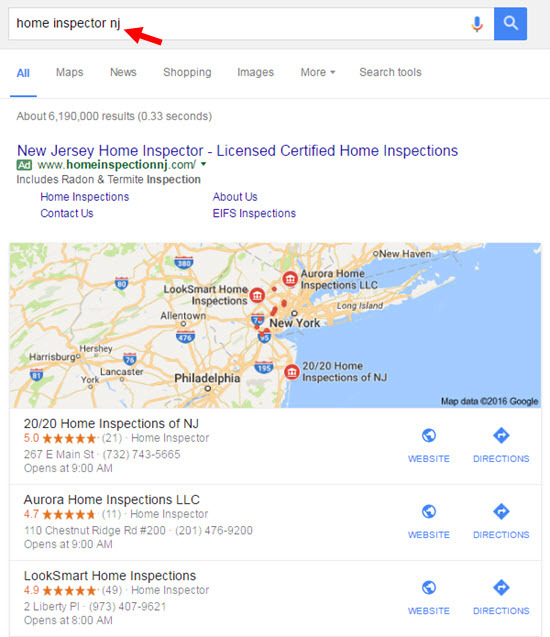 You might think that these days Google and other search engines are so hung up on providing users with hyper-local results that there’s no room for businesses that operate state-wide. Or that don’t have physical office locations near the searcher. Though that may be true to a certain extent, there are still opportunities to create local content and have searchers find you, as we did with our state hub pages. Introduction. A great opportunity to let visitors know upfront you can help them where they live, and that you speak their lingo. Also lets you work in some state-specific search terms. General FAQs. The job of any good website page or post is education and action. Sharing FAQs upfront tells your reader you know why they’re there and that you can help. And if you don’t know what FAQs to address, ask your visitors and customers. Or just listen to them a little more closely. Locations. Let people know your office locations, or the areas you serve. 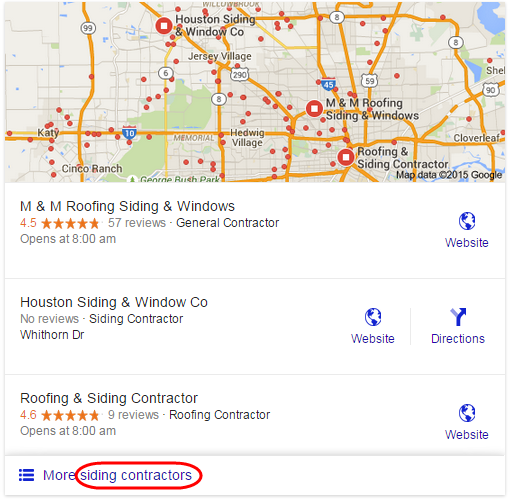 More opportunities for SEO by using state or location-specific terms. An in-depth look at your service, and how it’s geared to the place you’re targeting. Share with visitors how your service works in their particular area. 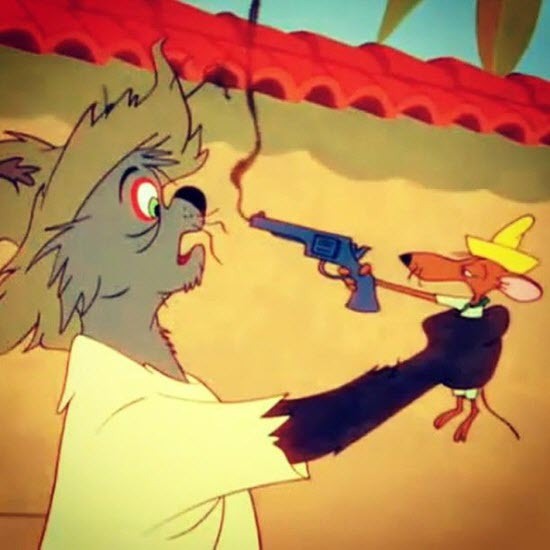 Is there something different about pest-control in Florida from how it’s done in North Dakota? Something tells me there is. Write about it so they know you know what you’re doing. Mention specific cities and landmarks and so on where appropriate. Call to action. Depending on how long your page is, you may want to have multiple opportunities for a call to action. But at a minimum, tell the reader what it is you want them to do next. Just because you’ve completed your project doesn’t mean it’s over. In fact, the work has only begun. Major changes like the ones we undertook required us to first set a baseline of where we were so that we could know if what we were doing was helping or hurting. We also had to put in place a system to monitor the changes we made, to ensure we were still getting the results we wanted. Yep, after all that writing and restructuring, we created even more work for ourselves. Undertaking significant projects like these can seem overwhelming. But if you’ve got a plan, maybe a team of professionals who can help, and the drive to see it through from start to finish, you can do it too. Joe and Cheryl have done a good job of avoiding the content hamster wheel, where you write 10 blog posts a month that not even mom reads, just because you heard that “Google likes fresh content.” Instead, Joe and Cheryl focused on the one-time, permanent content on their site: mostly the homepage and the “state” pages, with blog posts that are (1) designed to be helpful and that (2) have a long shelf life. They didn’t try to optimize every page for every state/region, and instead carved out specific pages to do that. They didn’t try to “optimize” every crack of the homepage for every state, and instead used it to describe their services in-depth, while adding just enough location-specific content for Google and visitors to sink their teeth into. They put in a ton of work, and have seen some very nice results, but are nowhere near “done.” They didn’t mistake a simple plan for an easy plan. What’s something you learned from Joe’s case-study? Any particular step you’re eager to try? How would you adapt it to your situation?